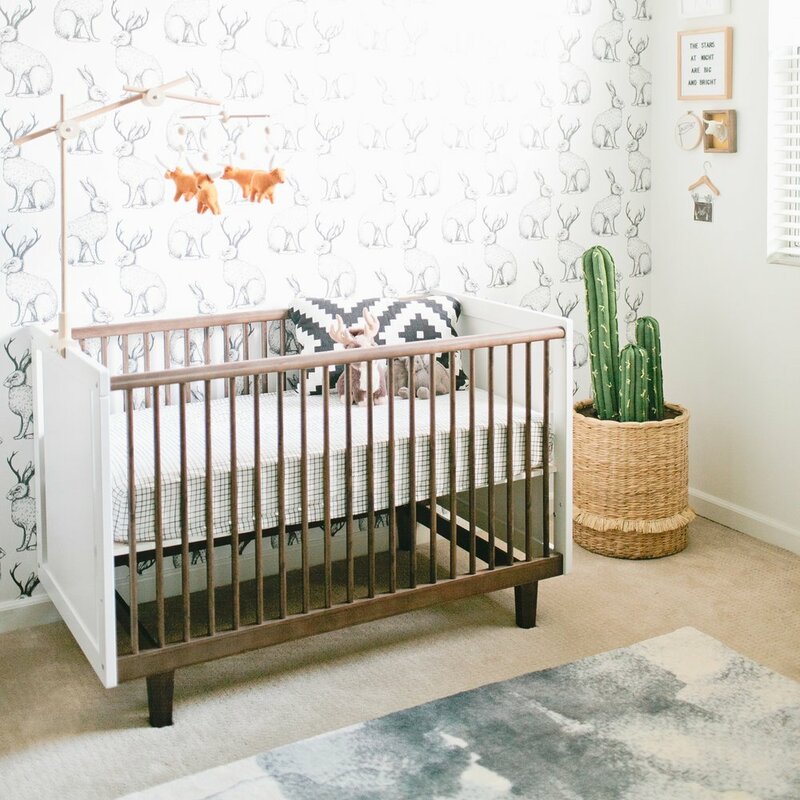 creating a nursery can be tough! at least it was for this pregnant lady! I procrastinated so hard that my husband was finishing up wallpaper on the accent wall legit hours before I got induced. I also am learning that indecisiveness is a total side effect of pregnancy and motherhood - too hard to make any decision so why bother - was my attitude. 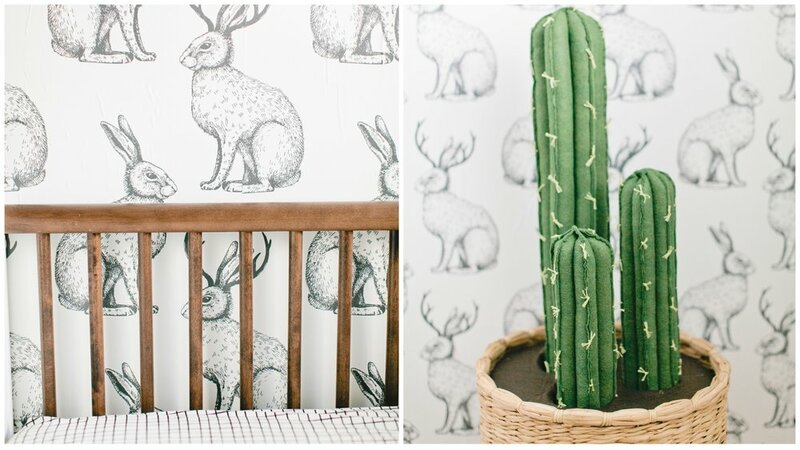 as daunting as it was at first, his nursery actually turned into my most favorite DIY project of all time. my husband and i are die-hard texans. (in fact, sawyer's middle name is a county in texas in which jake is from) so, we thought that our love for texas would be an awesome idea for a nursery theme. i'm not talking cheesy texas things, or what may come to mind - like no cowboy or nothing country related - no bandanas, or horses, or rodeo. our own personal interior design style is mid-century modern with pops of color, and that was our challenge - how to incorporate pops of texas with mid-century modern furniture in a simple space. so, for sawyer's nursery, we were able to tie in our elements of MCM with a nod to our texan roots in a clean and discreet way. i had his longhorn mobile custom made by a shop on etsy called nico and maddie. (my alma mater is the university of texas and probably my favorite thing in his nursery) I knew pretty instantly I wanted a longhorn mobile for him. I saw a ton of felt animal mobiles, but there was no longhorns to be found. I did find this magical shop and after collaborating on my ideas with her, she brought my vision to life! she sent a pic of a mock-up, i got to pick out the color of the longhorn, his horns and the colored felt balls. customizable to my heart's content! now, it's available for sale in her etsy shop for all those other future longhorns out there! the mobile arm was handcrafted by sawyer's papa! the one i had my eye on was from russia and more than i wanted to pay with shipping. so when that happens, i usually will just make something myself, but in this case, i enlisted the help of someone more capable than me in this arena. i absolutely love it, and its even more special now because it was handmade by someone we love. the jellycat bashful bat is a nod to the famous austin bats that reside under the congress avenue bridge, who emerge from the bridge in flight every day 20 minutes before sundown. the shelves are from ikea and the book collection are some of our favorite childhood books as well as gifts from loved ones. my favorite book that I vividly remember reading with my mom as a kid is that old library book back there called "dooly and the snortsnoot" by jack kent. aaaaand, believe it or not, I bought it like 10 years ago in preparation for this day and age. his mid-century changing table is a west elm knock off from world market. it's actually a media cabinet, and we replaced the knobs (which were silver) with these brass ones from CB2. our goal was to find a flexible piece that could be used later on, and also had to find something tall enough for his 6'4" father. that watercolor cactus print was commissioned by another wonderful shop on etsy (ironically based out of austin) called the gray poppy to coordinate with his watercolor rug that i did in fact get from west elm. the shel silverstein collection are relics from my childhood. 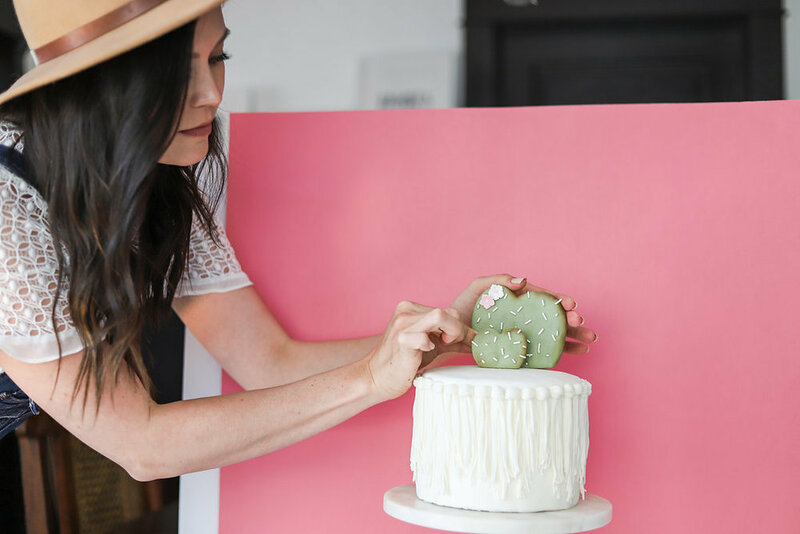 my favorite craft was this DIY i found from a beautiful mess. i bought the basket from target that was home to an actual real cactus in my house that didn't make it. (surprise, surprise) so at least now this cactus can live there forever! jimmy found a sewing machine in his complex with a note saying "still works", and sure enough, it sure did! i was so happy with how these turned out, and i'm so happy to now have a working sewing machine in my house for future projects! the crib is the rhea in walnut by oeuf. i was lucky to stumble upon a "rock-on" print from urban outfitters, and since it's basically the equivalent to our longhorn hand signal, it was perfect. I loved the idea of a gallery wall - but I needed the art and the formation to look clean and it initially looked super cluttered. so i found a small wall next to a window and stacked the art vertically. at the very bottom, we hung an ultrasound picture on this adorable photo hanger. (see below) I'm excited to switch out the pictures and the felt board from time to time, though I so love those lyrics to "deep in the heart of texas" - I can almost hear the longhorn band playing it like they do before every football game. this project was one of my all-time favorites. my husband and i consider austin our home, and we can't wait to take sawyer back to visit family and watch him fall in love with the city like we have. so many special elements for one special little boy. i sure can't wait to see my little boy grow up here and tell him all about how wonderfully crafted this room was just for him. photography by the lovely Megan Bravinder one month after sawyer's birth.